How did the Team in the Smallest Boat Win the Top Prize! 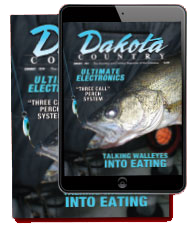 They slugged it out on North Dakota’s magical walleye factory, Devils Lake, June 26 and 27. The lake is so popular that the number of teams entered this year, 112, was a 36 percent increase over 2014. Walleye anglers love their boats, and “big” has been the word for the past decade as typical walleye rigs in the 20-foot range with 200 horses pushing them is the norm. Many of those boats were on Devils Lake for the 39th annual Devils Lake Chamber of Commerce tournament. Yet, it was the team fishing from the smallest boat that captured first place and $5,000. In fact, the boat’s name in lime green letters along each side is: Abbylander. Not Lund, Ranger, AlumaCraft or Crestliner, but Abbylander. That’s because winning partner Jarvis Kaderlik from Bismarck fished out of this same boat growing up. Dad Mike (also his tournament partner) refurbished the 1986 aluminum boat’s floor, seats, etc., to “brand new” status. He then gave it to his son for a wedding gift – hence the name. “It’s named after my main sponsor, my wife.” It does have an upgraded outboard, a 1986 60-hp Evinrude E-Tec. Top speed is 29.6 when conditions are just right. The top three teams all averaged four pounds-plus. Places 4th to 10th averaged 3 ½ pounds, while 11th to 23rd “money places” all averaged more than three pounds. 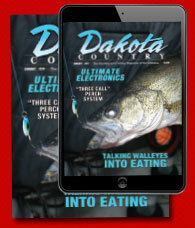 Teams weighed five walleyes per day. The largest perch, white bass and pike won cash prizes and many special awards were distributed. The northern pike day two shootout was won by Corey Anderson and Ken Remmen with two pike for 16.3 pounds and $1,025. The third place team of Jay Hagen and Jon Becker from Devils Lake also succeeded with artificial lures. They fished jigs in the “Doc Hagen’s area” for a nice fish, but quickly moved to main lake structure in 20 to 30 feet. “We snapped # 9 Jigging Rapalas (UV green) from one to two feet off bottom and slowly covered areas where we spotted fish.” They caught their biggest fish this way, and also ran spinners behind bottom bouncers baited with Berkley Gulp 3-inch minnows. Day two resulted in two 7-pounders deep, but with a short time remaining, they ran to the trees across from Graham’s Island tournament headquarters and finished their limit of 17-inchers. “The right bites make the difference,” Hagen said. Devils Lake is where fishermen go to catch fish. Guides, bait shops, tournament anglers and folks at the cleaning stations located around the lake will share what’s working and where. Or, call the Chamber of Commerce and Tourism Division at 800-233-8048. The website for complete tournament results and special award winners, resort, motel and casino accommodations, fishing reports, ramp locations, a lake map, plus regional activities for all ages and all interests is devilslakend.com.